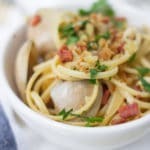 As promised an utterly delicious, oh so yummy, totally awesome, make my tastebuds dance recipe with clams. That’s no understatement, honest! I fell in love in the weekend. With clams. Yes, I’m talking about clams aka shellfish. Until yesterday, a mere few days ago, I hated the things. Blugh! All they made me think of was gritty chewy pieces of rubber that tasted vaguely like the sea. But now, I can’t believe I used to say such horrible things about my little preciouses. Oh how I have changed! They are tender sweet morsels that are just perfect little bites of the sea. Pretty good cooked, but even more perfect raw. I definitely prefer them raw but last night I wanted to use them as a main course for dinner and wanted a recipe for you all where you didn’t have to bother with shucking them (which isn’t too difficult by the way and if you’re really stuck, just pour a little boiling water over them and they will open right up). 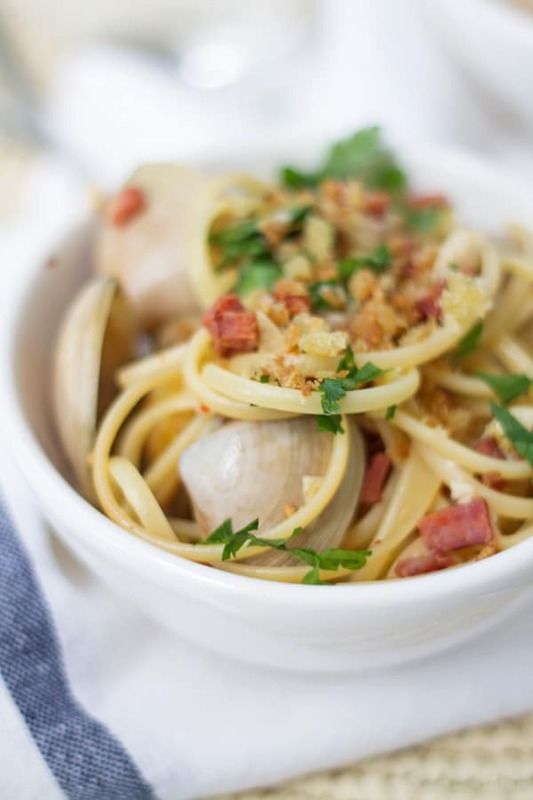 So I made this recipe for Chorizo, Lemon and Garlic Clam Linguini for dinner last night and it was Awesome (it deserved a capital A). Chorizo, garlic, lemon, white wine, chilli and seafood is a pretty classic combination that I actually use regularly with prawns and pasta. So this is not the most creative and original dish in the world, but it works and is utterly delicious! Why mess with the classics, hey? Okay, I did add a little tweak: a little bit of crunch with some crispy olive oil sour dough bread crumbs. Mmmmm! What’s even better is its ready in the time it takes for you to cook your pasta, thats just 12 min if you’re using dry linguini. 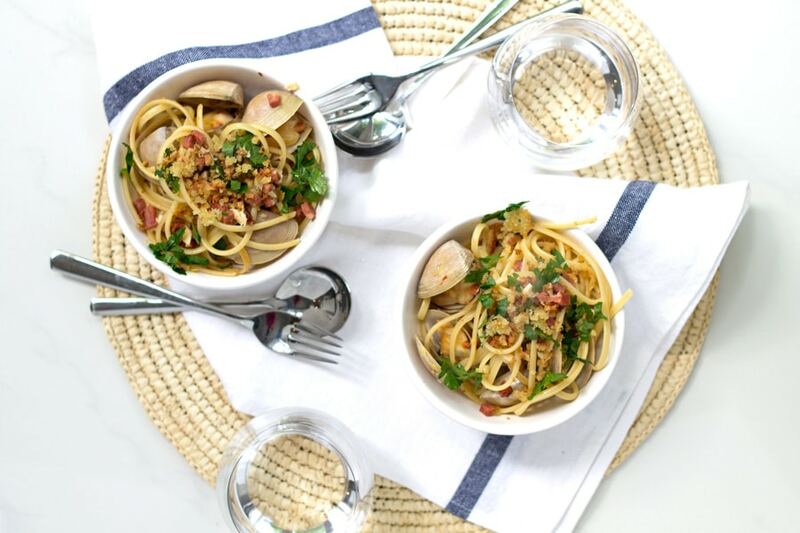 Twelve minutes for a mouthwatering seafood pasta…I’m sold! Bring a large pot of salted water to the boil. Add linguini and cook for 12min or until al dente (cooked but still firm to the bite). In a medium frypan/skillet over medium heat add olive oil and breadcrumbs and season with salt and pepper. Mix well and continue to mix regularly while cooking to ensure breadcrumbs do not burn. Fry for 1-2 min or until breadcrumbs are golden. Ensure you keep an eye on your breadcrumbs as the can go from golden to burnt in seconds! Heat oil in a medium Dutch oven or fry pan (that has a lid) over medium-high heat. Add chorizo and cook for 3-5min or until becoming slightly crisp around the edges. Add garlic and red pepper flakes, if using, and cook for a further 1-2min. Stir regularly to ensure the garlic does not burn and become bitter. Add wine, cook for 2min. Add clams, stir and cover. Cook for approximately 6 min or until the clams have opened. Once the pasta has cooked, drain and immediately add to the clam mixture with a few tablespoons of the pasta cooking liquid. Stir to combine (easiest done with tongs) sprinkle over chopped parsley and crispy breadcrumbs. Serve immediately with crusty bread. Note 1: To easily make sour dough breadcrumbs, take a piece of stale sough dough and grate on a box grater. Voila! You have breadcrumbs! 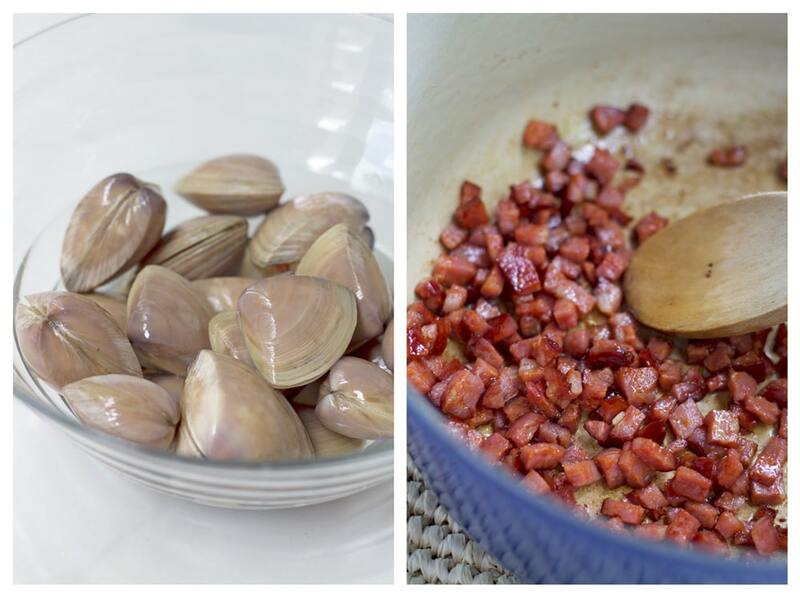 Note 2: I used the large diamond clams, if you are using smaller clams then you will need to reduce your cooking time. You will know the clams are cooked when their shells are open. Note 3: Discard any that do not open during cooking, these are not good to eat. 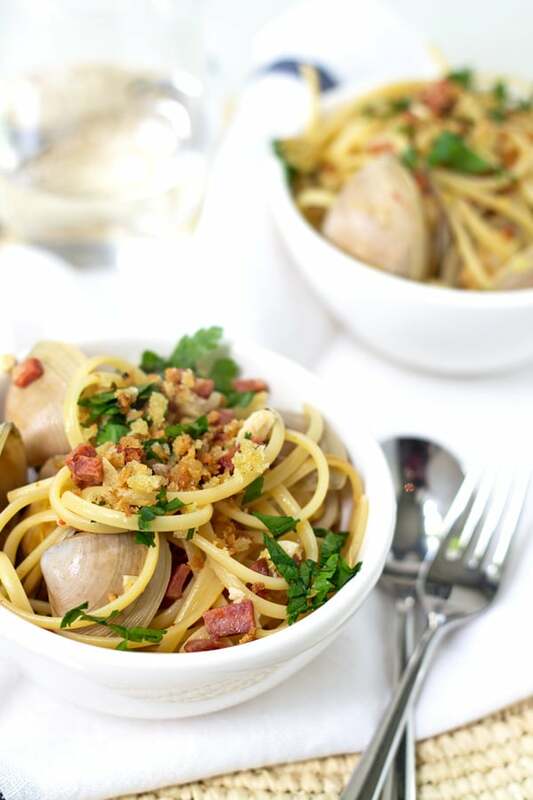 This is definitely a delicious pasta dish that I can see myself making for dinner this week.. thanks for sharing the recipe!